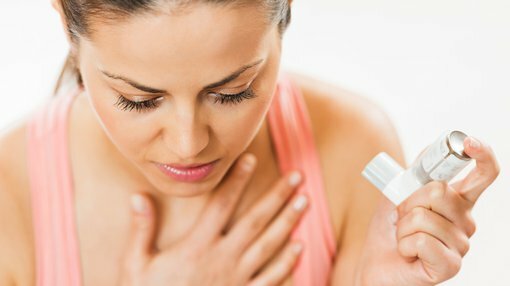 Respiri (ASX: RSH), a leading developer of technologies to assist in remote monitoring of chronic disease symptoms, has been awarded the CE Mark (Conformite Europeene) approval for the proprietary Next Generation AirSonea home monitoring device, which provides users with a robust and security compliant objective asthma monitoring and measurement system. Highlighting the potential revenue generating significance of this development, RSH’s Chairman, Leon L’Huillier said, “The European approval to market AirSonea was important to advance partner discussions, and it provides the commercial opportunity to pilot and test market the products from current inventory, a significant outcome in that it allows for the sale of the devices into the UK and Europe”. However, how much revenue will be generated is speculative and investors should seek professional financial advice if considering this stock for their portfolio. As a backdrop, the first generation AirSonea technology and software received regulatory approval in the UK, Europe and Australia as a Class I medical device. The world leading, updated AirSonea is a Class 11a medical device and as such, underwent a greater level of assessment by a third-party to achieve the updated CE Mark. The product also has a number of new technological features. Harnessing the processing power of the smartphone, the proprietary acoustic respiratory monitoring (ARM) technology is now housed in the app rather than the cloud so patients can measure their wheeze symptom without an Internet connection. Data is then automatically uploaded to the cloud when a Wi-Fi connection is established. 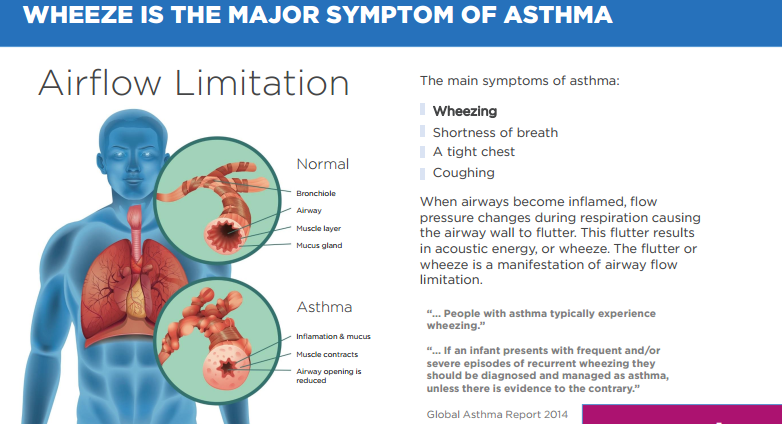 Patient data, including time and date stamped wheeze measurements, medication use and symptoms, as well as triggers are securely stored in the cloud for review by health professionals who until now relied on a patient’s memory or handwritten notes relating to their asthma management plan. 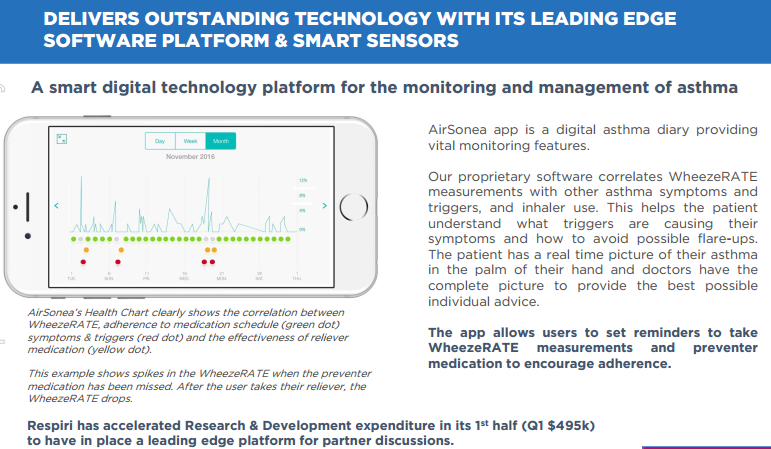 This assessment and approval is a critical step which validates the progress made to improve the AirSonea technology to be the world leading, gold standard in non-invasive, objective monitoring of asthma. CE Mark approval also completes the regulatory process to the highest level, allowing RSH to advance partnership discussions in one of the three biggest medical device markets in the world. While many product developers in the medical devices space struggle over long periods of time to gain approvals, RSH is now in a position where it can generate income from a product that doesn’t require a doctor’s prescription and is available on an over-the-counter basis. Importantly, RSH has first mover advantage in targeting a major unmet consumer need with its primary market being parents and carers of children who cannot perform lung function tests. Even from a broader perspective there is an increasing recognition of the benefits of mHealth solutions at a time when demand for medical resources is outstripping supply. Having the capacity to monitor and treat a condition from remote locations without visiting a medical practice is convenient for users and in some cases life-saving in terms of being able to quickly retrieve and communicate information, as well as responding with the appropriate medication or treatment. It is worth noting that there is general industry support for such devices as government’s struggle to develop infrastructure and bolster human resources to handle the increased demand for health services.